Designed for comfort and durability, this chair is tailor-made for larger-sized or taller people. The ergonomically contoured molded foam seat is extra thick with a waterfall edge for maximum comfort. 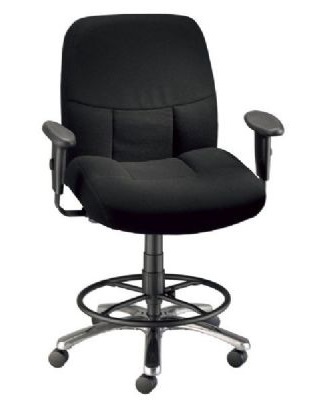 Pneumatic height control raises and lowers the chair quickly. The included armrests are height and width adjustable. Additional features include dual-wheel casters and a 26" diameter polished aluminum base. Seat cushion is 22"w x 21"d x 4" thick. Backrest is 21"w x 3½" thick, and rises 22" above the seat. Includes CK49 height extension kit and adjusts from 24" to 28".